Group dynamics are often interesting – and frequently challenging. Whether you have a group of people who live together or work together, they develop set ways of communicating and interacting with each other. These patterns may or may not work well. Yet, even when we recognize the need to make a change, the process of change is always challenging. 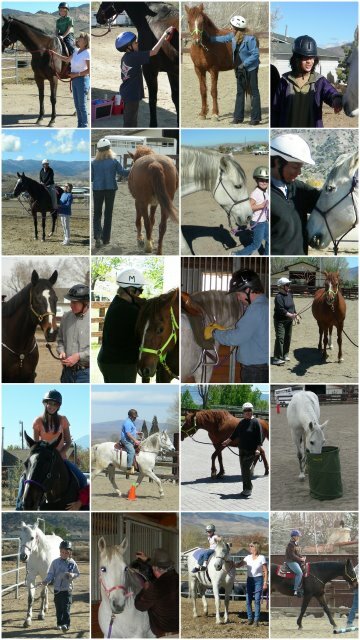 NEAT offers a variety of small group sessions which may include clients from a group home or residential treatment facility working on similar goals, a set of individual clients that come together to work on similar issues – such as students from a special school program – as well as a corporate group looking enhance communication, cooperation, and team work. 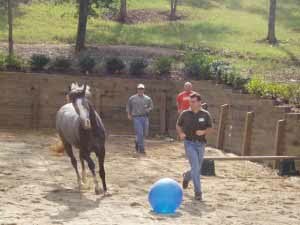 Our small group sessions are designed for groups of up to eight participants, facilitated by two certified therapeutic equine instructors and two or more horses. 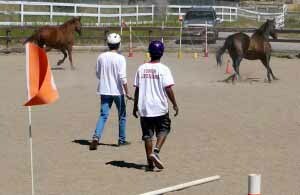 Whether your group is here for a one-day session or a series of sessions, goals and objectives will be established for the group, and these will be the basis of the activities planned with the horses. 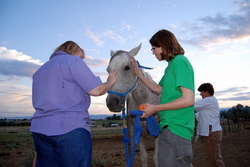 The process involves establishing a relationship with a horse on the ground and then evolves into the nurturing of that relationship, which may or may not culminate in actual riding in a contained area. 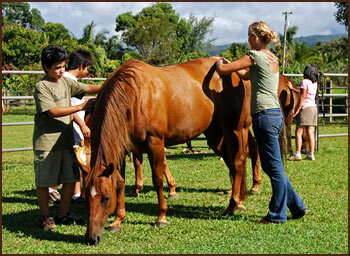 Activities in the process may include “joining up” with a horse, grooming, and group experiential exercises, including games and exercises that involve the horses’ cooperation. 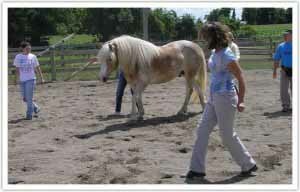 For example, the group may need to think creatively and work together in order to prompt a horse to go over a small jump without speaking or touching the horse. Through teamwork, the participants will develop critical thinking and problem-solving skills. Groups learn creative thinking skills, healthy risk-taking, and ways to function as part of a team.